Sandium Heating and Air Blog: One Room Too Cold? Yet another Room Too Hot? Using A Zoning System, It's all Perfect! One Room Too Cold? Yet another Room Too Hot? Using A Zoning System, It's all Perfect! Zoning systems enable you to have an increased level of control over how you feel in your house. Similar to how light switches provide the capability to manage your home’s lighting, zoning systems allow you to individually control the temperatures of various zones all through the house. 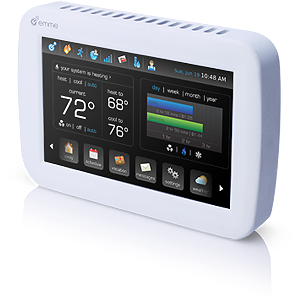 In a standard air system, the right temperature for the whole home is set by using a single thermostat. Zoning systems use a number of different thermostats, with each and every one controlling a separate area of the house. Somebody within a zone can adjust the temperature where they are without having to worry about bothering occupants in other places. This ensures that there is no more “battle of the thermostat,” with people fighting over where the thermostat ought to be set. This is certainly more cost-effective as the objective of trying to achieve one steady temperature throughout a whole home is rather unlikely. There are features found in many households that naturally make this challenging achieve. One example is simply the proven fact that heat will naturally rise, making 2nd stories warmer than 1st floors almost all of the time. Additionally, good sized windows or glass areas permit more heat to transfer, making warm or cool sections in various areas of the home. Zoning systems also allow you to more closely keep control of the amount energy you use. You can set regularly vacant zones to an energy-saving setting so you aren’t having to pay to keep an empty space air-conditioned. This can help minimize the wear and tear your HVAC system gets and help it to have a longer lifespan. An HVAC expert will help you to determine what zoning best option. He or she will utilize your help to figure out which rooms are being used less than others and just what structurel features may obstruct proper operation. The actual installation is a pretty simple process: It generally requires only thermostats, a user interface, dampers plus some minor ductwork changes. If you've been experiencing difficulity creating a constant temperature all through your house, a zoning system might be the answer you are searching for. Contact Sandium Heating and Air Conditioning today to get more information.